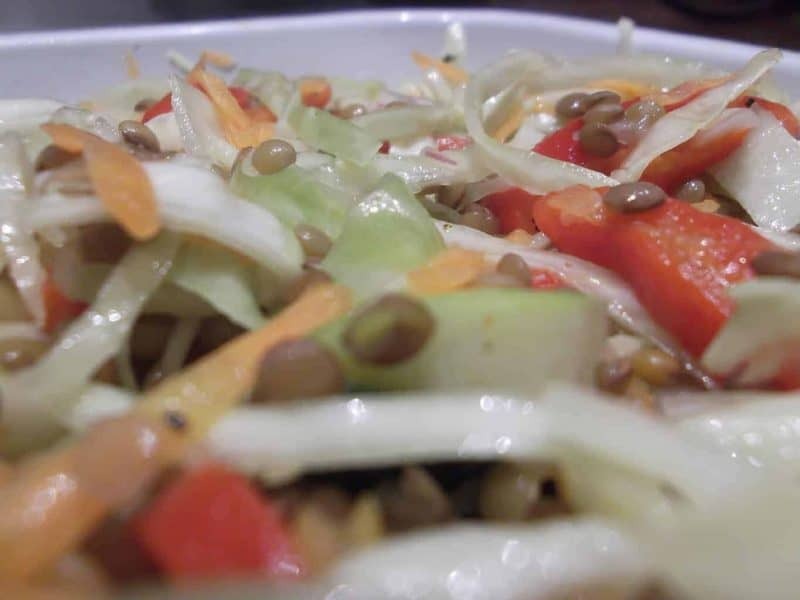 Healthy, soothing salad, full of goodness for the months after Christmas excesses! Thinly slice the cabbage and wash it well under cold running water. Salt and rub it with your hands, then place it in a colander or sieve and put something heavy on top to squeeze it. Leave it like this for 1-2hrs to get rid of all the excess water. Meanwhile, boil the lentils for 30mins or until cooked, ensuring they remain firm. Drain any water that’s left, drizzle a tablespoon of red wine vinegar and empty in a large salad bowl. Add the cabbage, carrot and sliced leek. Top with diced apple and the sliced red pepper. Drizzle the orange dressing, decorate with a bit of mint and enjoy a healthy, hearty winter salad!